CeBIT is over and it was a blast! On this year’s edition Switzerland stepped out into the limelight as the CeBIT Partner Country. Between March 14th and 18th more than 70 Swiss startups, established companies, universities and institutes of technology occupied more than 1700 square meters of exhibition space. Among the startups there, was a company called… dizmo! Chosen as the software partner of the canton of Zurich booth. Startups such as Beekeeper, Electric Feel, Digital Zurich 2025, Inno Motion, Learn Technologies, Spinning Bytes or the The Circle used our technology to present themselves and their offering. 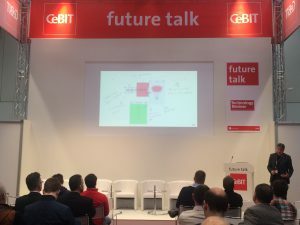 It was a great honour for us, while CeBIT offered us also the great chance to meet partners, customers, make new friends and get involved in enriching discussions about the future of technology and of course have a fabulous time with other CeBIT exhibitors, eating a lot of Swiss chocolate too! On top of everything we had the great opportunity to give three talks. With its finger on the pulse and at the focus of media interest, the conference forum “future talk” provided an overview of opportunities and solutions to the challenges of the digital future. Our CMO Luigi Mantellassi started his series of talks there where he reinforced the idea of making data relevant and consumable. Following Stephen Covey’s claim “Start with the end in mind” he elaborated on the question about data collection vs. data consumption, while he raised the question “When the IoT understands us, will we understand it?”. Second stage, same day: on the Swiss Pavilion stage the focus laid on the “simplification of things” and an unconventional approach that dizmo leads in order to make sense of the 2.5 Quintillion (for those who don’t know, that’s 18 zeros after the 2.5) bytes that have been generated every day in 2015 only. The third and last talk was all about dizmo itself with the focus on smart visualization and its use in the field of presentation and collaboration. In short: walking the talk of “digital transformation”, by means of dizmo to enable non-linear presentation techniques, using real-time data in an unbounded environment. 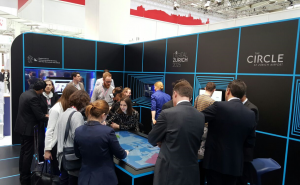 Our main take from CeBIT is that our industry is just at the start of “digital transformation”. It is an inspiring moment, full of endless possibilities, which when realized will transform the way we live. CeBIT was a step forward in such transformation, a great experience, we are proud of having been part of this amazing and inspiring crowd and we look forward to participating in CeBIT 2017. PS: To get an impression of CeBIT, have a look at the “CeBIT in 100 seconds – partner country”-video featuring dizmo!